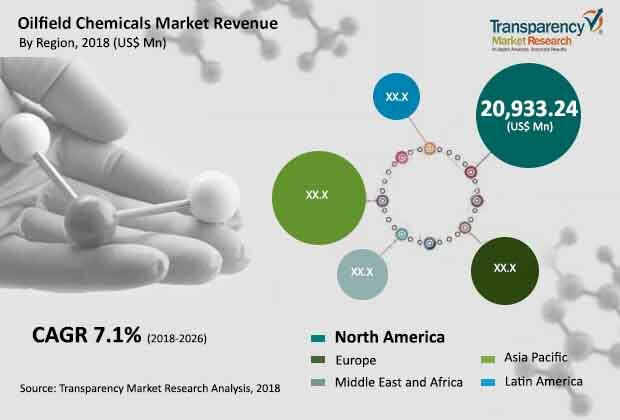 The global oilfield chemicals market has a myriad of market players and displays an immensely competitive market, reports Transparency Market Research (TMR). Prominent players in the global oilfield chemicals market are increasingly adopting strategies such as mergers and acquisitions to strengthen their ground in the market says TMR. Some of the key players in the global oilfield chemicals market are Baker Hughes (A GE Company), Halliburton, Solvay S.A., BASF SE, Schlumberger Limited, and Newpark Resources Inc. The global oilfield chemicals market is encountering major technological changes and innovations in order to keep up with the rising demand and applications of the oilfield chemicals. Blue Gentoo has developed a new product called the intelligent hydrate platform. This product facilitates the digital transformation of oilfield by providing a real-time management of gas hydrates. One of the biggest challenges of the oilfield industry is the mitigating the risks. To tackle this issue, numerous companies are deploying advanced robotics than can be operated by humans. The new robotic P100 snake arm built by OC Robotics operates in confined spaces thereby, improving the inspection outputs. The global oilfield chemicals market is expected to register a CAGR of 7.0% from 2018 to 2016. In terms of revenue, drilling fluids segment is expected to dominate the market owing to the growth in drilling activities. In terms of value and volume, the well stimulation fluids segment is expected to grow at the highest CAGR during the forecast period, on account of increasing applications. An increase in oil exploration activities has resulted in a rise in demand for oilfield chemicals. This has led to a surge in the production of oilfield chemicals, thus propelling the global oilfield chemicals market. Additionally, the prevalence large amount of shale gas reserves and the soaring production of shale gas have contributed to an expansion of oilfield chemicals market. Moreover, usage of the oilfield chemicals in various applications such as production, improved oil recovery, cementing and drilling, and well stimulation has fuelled the market’s growth. Further, an increasing demand for petroleum and natural has expedited the growth of global oilfield chemicals market. Supply-demand imbalance and environmental concerns may hinder the growth of global oilfield chemicals market. However, technological innovations and a rise in production of eco-friendly oilfield chemicals will spur the oilfield chemicals market’s growth. In addition to this, numerous are engaging in research and development activities to enhance the performance of oilfield chemicals, thus facilitating an expansion in the market. Regions with declining oil production present a major growth opportunity for oilfield chemicals market as they highly rely on oilfield chemicals for their production activities. For example, the producers in the U.S. are increasingly using oilfield chemicals to keep up with the growing demand. In addition to this, a huge investment in the energy sector by India has also presented significant growth opportunities for the market. The global demand for unconventional energy sources has led to a large scale production of crude oil, thereby creating many opportunities for the global oilfield chemicals market. The Middle East is one of the largest producers of crude oil and the market in this region is expected to grow exponentially during the forecast period. Additionally, an increase in horizontal drilling activities has strengthened the growth ground for the oilfield chemicals market.